With the disc brushes FAPI-ADBRUSH the filling material is cast into the carrier body of the disc brush by means of a special adhesive technique. In contrast to the insertion/pressing of the fill material into prefabricated bores – as it is done in standard production – a much denser brush structure can be achieved with the disc brush FAPI-AD(hesive)BRUSH. The disc brushes FAPI-ADBRUSH are particularly suitable for “wet” machining processes. When using our disc brushes FAPI-ADBRUSH, the highest surface qualities of the workpieces after the deburring process and the shortest possible machining times are required. The disc brush FAPI-ADBRUSH meets these requirements at any time and thus improves the machining process “deburring”. Due to the very dense fill, which can be achieved with the Adhesive Technology method, the service life of our disc brushes FAPI-ADBRUSH is extended many times over. This results in both a reduction in unit costs and a reduction in set-up costs for the deburring process to be performed. The disc brushes FAPI-ADBRUSH are used for deburring in the operational practice on a very large product spectrum. Workpieces made of a wide variety of materials with a wide variety of geometries are machined. In particular, the very uniform edge rounding on mainly flat surfaces by the disc brush FAPI-ADBRUSH is used in the automotive industry (engine blocks, cylinder heads, etc. ), in the metal processing industry (stamped and pressed parts, sintered parts, die cast parts, etc.) and in the aerospace industry (hydraulic parts, pneumatic parts, sealing surfaces, etc.). 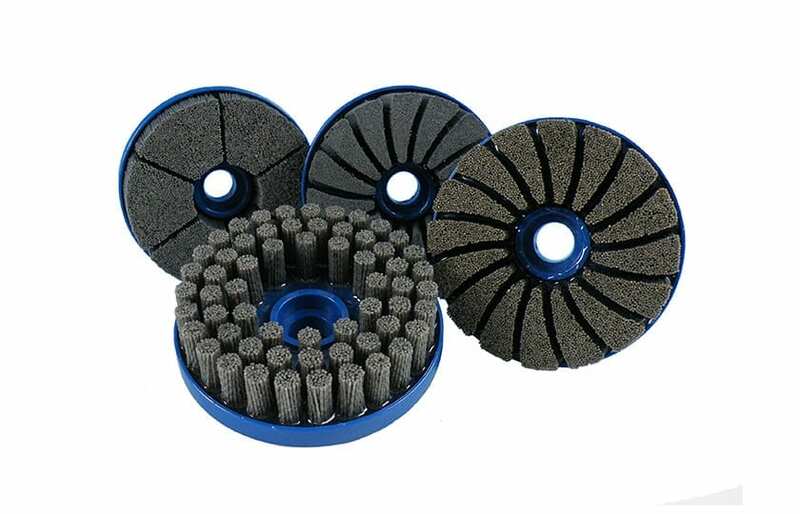 In order to meet the demand to provide our customers with high-performance tools for their machining processes, we only use high-quality fill material for the production of our disc brushes FAPI-ADBRUSH. Highly abrasive abrasive bristles are available with aluminium oxide, silicon carbide, ceramic and diamond grits.